Directions: From Gasquet Visitor Center, Take Hwy 199 west 7.2 miles to South Fork Rd. Turn left onto South Fork Rd and follow the sign to river access. Park in the river access area. Walk back and across South Fork Rd. Trailhead is on north side of Tryon (2nd) Bridge. While most people are retreating to the Smith River for a swim at the ‘Forks’ swimming holes where the South and Middle Fork of Smith River meet, a great alternative to the beach crowds is a hike up Craig’s Creek Trail which ends at the junction of Craig’s Creek and the South Fork Smith River. 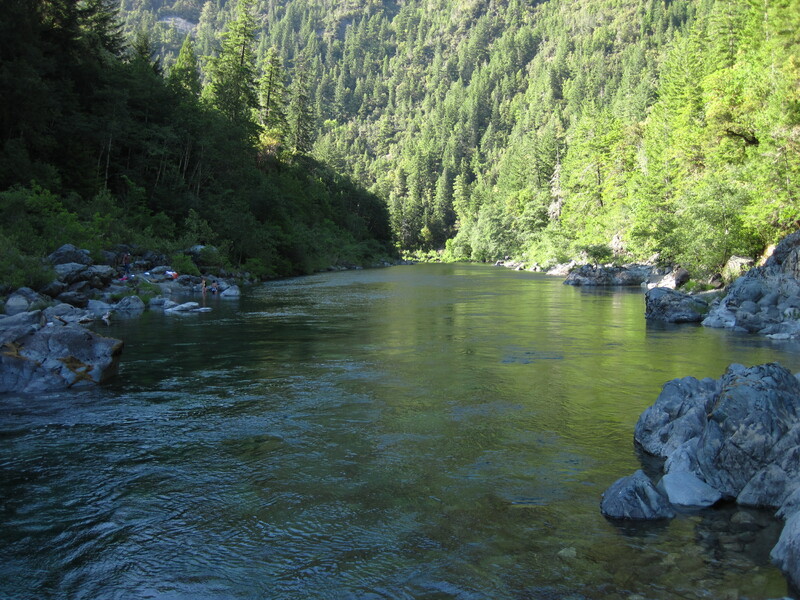 It’s a more secluded stretch of the river where you can cool off with a hard earned swim. Hike back to your car when the sun drops in the sky or in the mild evening air, hillsides aglow, and filled with the promise of the cooling dusk. Craig’s Creek trail was originally followed in the late 1800s by gold and platinum miners and their pack horses. Arthur Germaine was one such miner who hitchhiked from his parents’ home in Southern California after serving during World War I to establish a successful gold claim at Craig’s Creek in the 1920’s. The trail hugs the hillside from its starting point at the north side of Tryon Bridge, which spans across the South Fork of the Smith River. A dense canopy of Douglas Fir, Tan Oak and knob cone pine immediately shades hikers once they step onto the trail; a welcome relief on a hot day. While the trail meanders through forest with scant views of the river, the sound of rushing water is the music that wills the afternoon. For those interested in a shorter hike, just 1.75 miles from the trailhead hikers will find a view through the trees of a bend in the South Fork Smith River. The trail is wide and gently sloped. It’s perfect for a casual walk or a quick paced run, but be aware of poison oak along the edges. It’s easy to avoid if you’re paying attention, but poses a threat to young children dawdling behind. Don’t forget that it’s also possible to get poison oak from your dog’s fur. So either leave them at home or keep them tightly leashed. When the trail rounds a bend to the east and descends into to the Craig’s Creek basin you’ll pass through live oak, chinquapin and alder. The trail doubles back on itself and drops down near the Creek and follows it to its confluence with the Smith River. At trail’s end there is a derelict donkey engine—a reminder of the mining days. Continue on to a boulder beach and tranquil riverside oasis. Plenty of smooth large rocks dot the shore to support and warm swimmers after a refreshing dip or swim. Across the river and just downstream is the Craig’s Beach Day Use area accessed from the South Fork Road. A few Craig’s Beach visitors wander upstream from Craig’s beach, but it’s likely that you won’t see anyone at all. The return trip traces the trail back and after the initial incline out of the Craig’s Creek drainage is mostly rolling to level. By the time you reach the trailhead many of the beach goers at the Forks will have departed, offering a second chance to refresh in a deep clear pool with a sandy beach surrounded by cliffs.